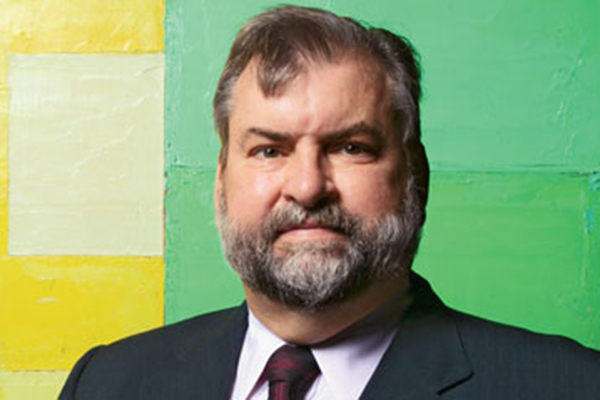 Kevin Consey, director and CEO of the Museum of Contemporary Art Chicago from 1989 - 1998. 2002 photograph, courtesy of Kevin Consey. I spoke with Kevin Consey in San Francisco via telephone from Chicago. Consey was hired as the director and CEO of the museum in 1989 at a time when the armory had been secured, a new business model helped establish institutional roles, and a progressive plan was instituted for funding the museum's new venture. Kevin Consey arrived at the MCA after having successfully completed a $50 million campaign for the construction of the smaller Newport Harbor Art Museum in California. In the conversation Consey, 24 years after the fact, said, "I guess I didn't realize at the time ... the scale and challenge of both raising money and raising community awareness and physically going through a construction process, which seemed to be a fairly logical and linear pattern. The complexity was not apparent to me at the time. But nevertheless, I took it on as a farily methodical and logical chore." Consey credited the board of trustees' vice-chair Jerome Stone as being instrumental in the process by "thinking thoughtfully about how to synchronize the physical process and conceptual process of organizing the museum's construction project with the delicate task, and very hard task, of raising an enormous amoung of money for a museum that was not the Art Institute of Chicago." As the chair of the museum's $55 million capital campaign, Stone, is credited by others as nearly singlehandedly raising those building funds. Citing the the MCA's trustees' generous individual pledges that made up $37 million of the campaign, Consey contextualized from his experience: "The scale of the Newport Harbor Art Museum's budget was probably less annually than any one of their pledges for the new building in Chicago." Kevin Consey relayed the anxiety and excitement of opening a new quadruple-sized MCA during the six years of preparation, while also directing the existing museum, citing a sometimes surreal experience: "We were still trying to run a credible program at 237 E. Ontario while still doing all of the planning and conceptual work and thinking about the future. So you're dealing both with ... 1996 and 1990 in your mind at the same time. So it's kind of a form of daily time travel." 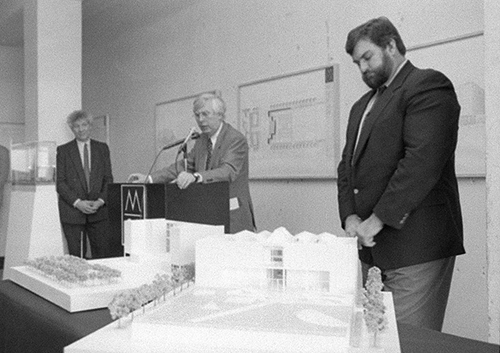 Left to right: Allen Turner, MCA chair of the board and chair of the architect selection committee; architect Josef Paul Kleihues; and MCA director and CEO, Kevin Consey. The men are pictured at the March 19, 1992 press conference held in the Chicago Avenue Armory to reveal the design of the museum that would open in June 1996. Listen to Kevin Consey's and Allen Turner's recollections of the process of selecting the architect and working with Josef Paul Kleihues, here. Once the new MCA opened in June 1996 and Kevin Consey's contract had come up, he told me that his contract was not renewed. "I was informed that my contract would not be renewed, and that they were going to go in another direction. So I began to think about other options, and UC Berkley recruited me, and I left Chicago with the building done, and I didn't have the satisfaction of really running it for any substantial period of time." 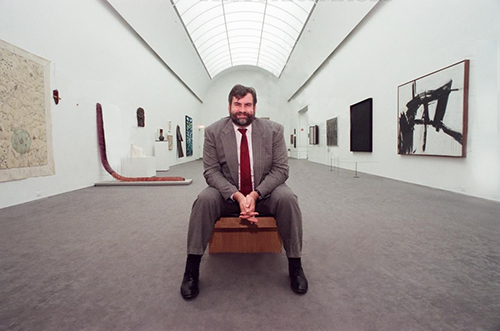 Consey in the MCA's 4th floor gallery, November 10, 1997, just prior to his departure. In the final 7 minutes of the recorded conversation, Kevin Consey addresses what I had learned was an ongoing issue regarding the MCA's organizational structure since its inception: the lack of a clear definition of the roles and responsibilities of the museum's trustees and its staff in general, and in Consey's particular example, in relationship to exhibitions.